Clay Johnson pulled out his iPhone to illustrate the kind of mashup that&apos;s possible when coders get their hands on data churned out by government, whole reams of transactions on where federal money is spent, who gets it and how it&apos;s used. "It blows your mind, right?" Johnson asked. "This is the tip of the iceberg." What if, he suggests, an application could track all government spending on the federal, state, district and city level? What if it were able to personalize the data by inputting the taxes you paid this year to calculate — to the cent — what your contribution was to this road you&apos;re walking down right now? 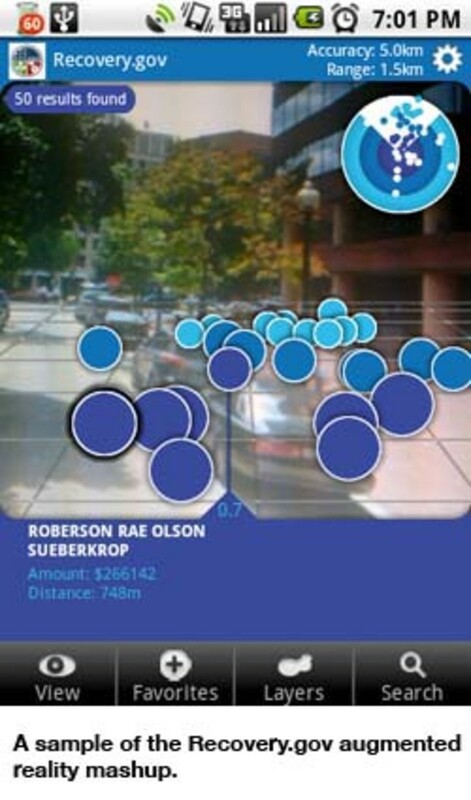 The Recovery "augmented reality" mashup was created by James Turk, a developer in the Sunlight Labs project that Johnson directs. Their experiment is an arm of the Sunlight Foundation, an open-government advocacy group Miller-McCunefirst mentioned in the January/February 2009 issue of the magazine. Some of the organization&apos;s other projects turn dense government data into vivid graphics and charts laymen can appreciate. Someone, though, has to make the data available to the coders to get it to citizens. And that is where Sunlight Labs comes in. Today, it is an open-source community of more than 1,000 developers from across the Internet hacking away on data sets newly available through sites like Recovery.gov, devising interesting ways to parse and present them. "[Sunlight Labs] now is, I think, where I&apos;ve always wanted it to be," Johnson said, "which is out of our control." Now largely run by the community itself, Sunlight Labs has created a kind of online app store (a free one, that is) for open government, with about 100 apps that do things like track which senators are most likely to block legislation using a filibuster (the aptly named app "filibusted"), or to mash up any two data sets off data.gov ("datamasher"). Both were winners of the labs&apos; "Apps for America" contests. "Programmers think very rationally," Johnson said, "and I think a lot of programmers want to basically digitize their government so that it behaves to them more rationally." The project predates Barack Obama&apos;s arrival in Washington with his Gov2.0 pledges to make the town more transparent. But opening up the current administration, Johnson said, isn&apos;t less frustrating than opening up the notoriously tight-lipped previous one. "It&apos;s just different frustrating," he said. "Here&apos;s a good example: dating," he explained, laughing at his own analogy. "Who would you rather be courting? You go after someone and say, &apos;Do you want to go out?&apos; And he or she says, &apos;No.&apos; Or, you go after someone and say, &apos;Do you want to go out"? &apos;Yeah sure, maybe some day.&apos; That&apos;s what the current administration does to an extent." A lot of the data the government does provide now is messy in a man-made way, riddled with typos a computer can&apos;t correct, or presented in a format — like PDF files — a developer can&apos;t readily work with. And so Sunlight Labs works not just to invent possibilities for developers, but also to show government what&apos;s possible with a more dedicated effort — like the mashup of Recovery Act spending in your neighborhood, on your iPhone. As the administration should appreciate, such a tool blunts at least some of the criticism that people can&apos;t see where that money has gone.